A very rare two-sided version Pra Sum Gor Kru Wat Tap Khaw Benjapakee amulet, 'Long Rak Pid Tong' (lacquered with gold leaf) pristine and clearly identifiable preferred modelof particular beauty with highly refined features, of Pra Niyom Master Class. 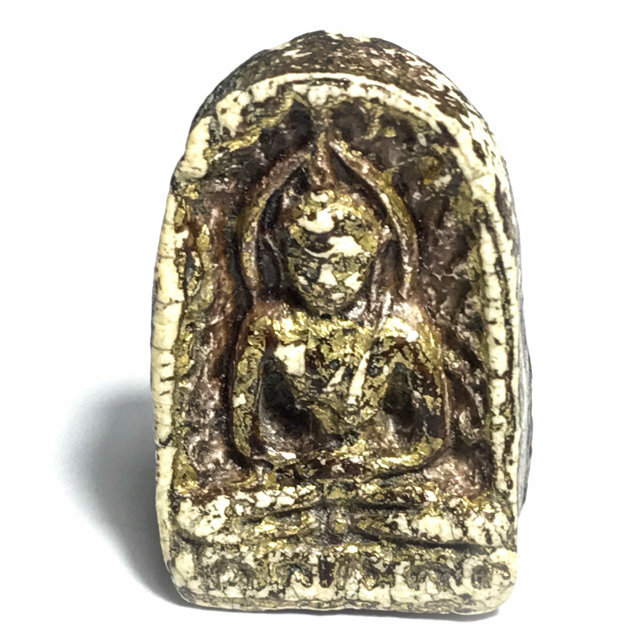 The Pra Pim Sum Gor was found in smaller and larger sizes (Pim Lek, Pim Yai), this Pim measuring 3 x 2 Cm. The Muan Sarn Sacred Clay has all the expected features and identical aspects to that found in the legendary Pra Somdej Wat Rakang Kositaram of Somdej Pra Puttajarn (Dto) Prohmrangsri. The design factors of this extremely rare two sided Pra Sum Gor are extremely attractive, with highly distinguished features and characteristics, The ancient red 'Rak Chaat' lacquer and gold leaf increases the beauty and character of this truly ancient sacred amulet. The Amulets of the Kru Wat Tap Khaw themselves are older than even the Pra Somdej of Somdej Pra Puttajarn (Dto) Prohmrangsri, of Wat Rakang Kositaram (first two of three consecutive finds/batches), and are reference study amulets for students of the lineage of amulets of Somdej Pra Puttajarn (Dto) Prohmrangsri and Ajarn Saeng.